British comedy series are thankfully aired very often on our free to air and pay TV in Australia, and we've seen some absolute gems of the genre over the years. I've a fondness for a lot of UK comedy and am always surprised at how unerringly the country produces pure comedy classics year in and out. UK comedy is a genre all its own however and as I've experienced with friends, it's not for everyone. The Fast Show isn't going to change your opinion of it, but for fans, its a classic skit series than deserves a place alongside the best the UK's produced. If you had to some up The Fast Show in as few words in possible it would be "running joke". This kind of comedy either works for you or it doesn't, I find it hilarious, and the situations and characterisations in The Fast Show provide some very, very funny skits that will become familiar by the third episode, but they'll always be funny. The cast of the series is where all its strength comes from. Many familiar faces were members of the Fast Show cast before they went on to more widely acclaimed roles, such as John Thomson who went on the Cold Feet series, and Caroline Aherne who went on to write and star in The Royle Family. The main star in the Fast Show is Paul Whitehouse, a performer with a comedic talent that's perfectly matched to quick fire sketch comedy. He masters a very wide range characters and delivers incredibly humourous performances, mainly due to his writing and creative talent that is the real backbone of the series. Series 2 of The Fast Show is where the show really hit its stride. The recurring skits get more developed and the subtlety of some of the less obvious sketches really start to shine. The tortured relationship between lord of the manor Ralph, and his groundskeeper Ted creates some of the most uncomfortably funny series of sketches I've ever seen. Many new characters are introduced and the timing and delivery of the cast is synchronised perfectly with the writing. The latter series of the Fast Show continued this, but offered little genuinely new ideas. 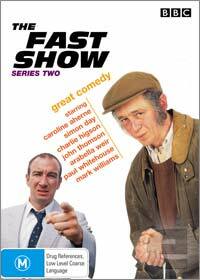 They are still very funny works, but I do believe series 2 is the most solid offering of The Fast Show, and for fans of this genre, this DVD deserves to be in your collection. In a most unfortunate trend that the BBC have been perpetuating of late, The Fast Show Series 2 gets a very, very average DVD treatment. There is nothing more heartbreaking to a fan of a TV show who has waited years for their favourite programmes to be transferred to the DVD format, with all its available features and extras, and then getting the episodes and nothing but the episodes in their purchase. The BBC have been guilty of this on far too many occasions, with little to zero extras being offered for TV shows that, frankly, deserve much better. Buying The Fast Show series 2 nets you the episodes of the series and nothing else; no commentaries, no deleted scenes, no bloopers and no attempt at all to use the DVD format for anything but the most basic menus for episode selection. Four or five years ago this was forgivable, but in this day and age when all manner of classic TV shows are being released with never before seen footage and commentaries from the creative and cast talent, it makes these BBC release seem like a quick cash in, more than any kind of archival record of the fans beloved show. The DVD presentation makes for a very basic set of sterile menus to navigate around the episodes, if anything, at least it makes the process to finding your favourite episodes very streamlined. The visual presentation is on par with your average modern TV transfer. The 4:3 picture is generally free of any distracting artefacts and is very watchable, if unspectacular, as one would expect. The audio is present in two channel stereo which provides clear dialogue (the most important aspect) adequately. You aren't watching the Fast Show to demonstrate your new home theatre set up, so what's on offer here is good for the material and provides a good experience without any distractions inherent to the video and audio transfers. The presentation lets you get down to enjoying the comedy, which is what its all about. TV shows when presented on DVD need to offer more than "just" the episodes. From a consumer point of view, you are getting very little value for money. Aside from a little bit of extra quality in the audio and video, you are really no better off than you would be with your old VHS recordings. The quality of the content in the show demands a much more thorough DVD and adding this to your collection really gets down to how much you love the show, and how worn out those old VHS tapes are getting. Fans of the Fast Show looking for a replacement for them will get sufficient value, but DVD fans looking for more will be disappointed.